Ise Shrine said Monday that Sayako Kuroda, 43, the daughter of Emperor Akihito and Empress Michiko, has assumed the post of special sacred priestess it established for a notable event next year. Kuroda, who was known as Princess Nori before she married commoner Yoshiki Kuroda, took the post on April 26 in order to assist 81-year-old Atsuko Ikeda, the Emperor's older sister and the most sacred priestess at the Mie Prefecture shrine, which honors the ancestral gods of the Imperial family, in presiding over rituals. Kuroda will serve until the October 2014 end of a series of festivities for the Shikinen Sengu event, in which symbols of the gods are transferred to a new shrine building that is reconstructed every 20 years. Ikeda took up her post in 1988. The new post was created to help her due to her advanced age. Kuroda, who was also formerly known as Princess Sayako, left the Imperial family when she got married. The most sacred priest or priestess serves the Sun Goddess, Amaterasu Omikami, on behalf of the Emperor and leads Shinto priests at the shrine. 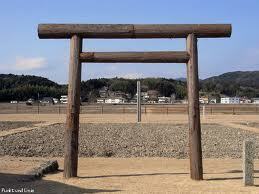 The post has been held by current or former Imperial family members.
. Ise shrine 伊勢神宮 Ise Jingu . During this time, the distinction between Buddhist temple and Shinto shrine was not so distinct and many religious places housed both.
. Ise Ichi no Miya 伊勢一の宮 - Ise Jinguu 伊勢神宮 Ise Jingu . It is not such a long time ago that Shinto was widely regarded as a timeless feature of Japaneseness, affected by historical change only on a superficial level. Recently, however, a range of scholars have sought to overcome such essentialism by putting the abstract concept of Shinto to one side, and focusing instead on the impact of Shinto on selected sites, rites, and myths at specific historical junctions. 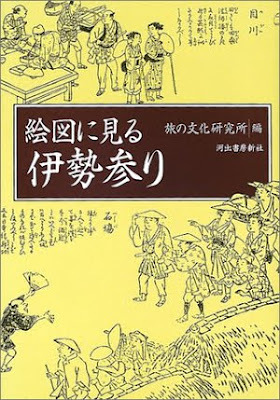 By restoring the concrete contexts of “Shintoization,” such studies expose the historicity of supposedly timeless practices and notions and reveal the motivations and strategies of human agents both in adopting or imposing Shintoization in the real world, and indeed in developing the concept of Shinto in the first place. To a great extent, Shintoization has taken the form of assimilation to the imperial shrines of Ise. Ise, however, is itself not an a-historical phenomenon. In post-Meiji times, new visions of Shinto have been applied most drastically to Ise, and the site has then served as a model for similar reforms at other shrines. Ise, therefore, has not only been a passive object of Shintoization, but also the main pioneer and referent of the concept of Shinto itself. In fact, “Shinto” was first conceptualized at Ise, by Ise priests. In this talk, I will pinpoint the concrete historical circumstances in Ise surrounding the early emergence of some fundamental Shinto orientations, leading to the first tentative conceptualization of Shinto in the Kamakura period. The news was picked up by some Japanese media because the shrine used, for the first time, words such as kami (神, God or deity), matsuri (祭り, festival) and jinja (神社, shrine), rendering them untranslated in romaji (ローマ字, Roman letters), instead of using their English equivalents. 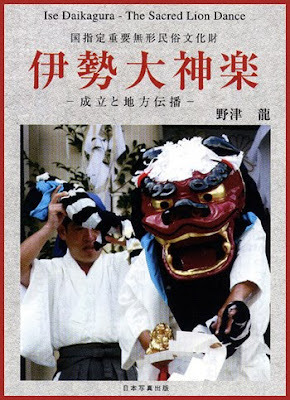 Ise Jingu and Jinja Honcho (神社本庁, Association of Shinto Shrines) copublished the booklet in April. Their aim is to make Shinto-related words such as kami known to the outside world, just as judo (柔道) and ninja (忍者) already are. “(The word) Shinto has already become known. 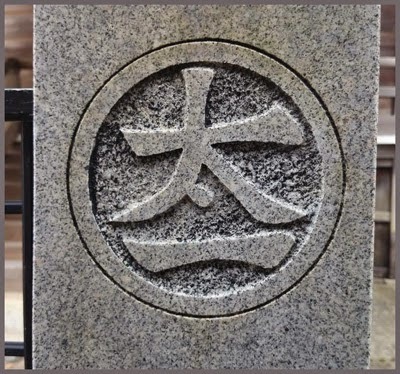 It is time for us to sekkyokuteki ni (積極的に, proactively) hasshin suru (発信する, transmit) other words related to jinja and Shinto so their honrai no (本来の, true) meaning can be widely understood,” an Ise Jingu spokesman said. The booklet “Soul of Japan” says that a deity is a god in a tashinronteki (多神論的, polytheistic) belief system, and thus deity is a somewhat appropriate translation of kami. However, Ise Jingu and Jinja Honcho want to differentiate kami from the deities of other religions. “It’s not wrong to say kami are Shinto deities. But a deity is not a very common word, and we thought using the word kami was more appropriate. So we may as well spread the word ‘kami,’ and want people in the world to know kami as kami,” the spokesman said. 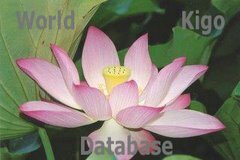 Moreover, in explaining to Japanese people what God or a deity is, we probably have to use the world kami because there is no other better Japanese word. To clarify the difference between God and a deity in Japanese, you basically need to say that God is isshinkyō no kami (一神教の神, monotheistic “God”) and that a deity is tashinkyo no kami (多神教の神, a polytheistic deity). After Ise Jingu and Jinja Honcho published the booklet, all other jinja in Japan will probably follow suit because the two bodies are effectively the official organizations for jinja. Following the move, the city of Ise in Mie Prefecture changed its traffic signs in line with the English description of the booklet. The booklet explains that Shinto teaches that there are kami in the mountains, forests and other things. There are yaoyorozu no kami (八百万の神, 8 million kami), as a saying goes. Mountains and forests are the origin of jinja, the booklet explains. Kami derived from nature, such as the kami of rain, the kami of wind, the kami of mountains, the kami of the sea and the kami of thunder have a deep relationship with our lives and profound influence over our activities. Individuals who have made a great contribution to the state or society may also be enshrined and revered as kami, according to the booklet. The booklet also shows with text and drawings how to perform temizu (手水, purifying one’s hands and mouth with a wooden dipper before approaching the main sanctuary of a shrine, basically the act of washing hands and gargling) and the etiquette when praying to kami. Shrines usually have stone water basins for temizu. On the J-Cast News website a gengogaku senmon no daigakukyōju (言語学専門の大学教授, professor specializing in linguistics) said that words describing a Japanese concept that does not exist outside Japan are easily absorbed into English. For example, the term emoji (絵文字, a combination of letters that looks like a drawing) is often used in English. Interestingly, Toyota Motor Corp.’s kaizen (改善, improvement) is now used in English, the website says. The word kaizen became noticed when Japanese automakers outperformed global rivals , such as General Motors, in 2000s and the global automobile industry were trying to learn from Toyota’s business methods. Linguistic experts also say that such Japanese-English words tend to be adopted if they are shikaku ni uttaeru mono (視覚に訴えるもの, lit: something appealing to sight, but actually a tangible thing) or jissai ni taikan dekiru mono (実際に体感できるもの, something you can actually experience). For example, the words “anime” and “manga” are now used worldwide because people can watch and read them. And the Japanese word “tsunami” became a universal word after the English term “tidal wave” failed to correctly describe the horrors people saw after the 2004 Indian Ocean tsunami. It is unknown if kami and jinja will reach the same level of recognition as ninja and judo. But those words will certainly spread little by little if Shinto kankeisha (神道関係者, people involved in the world of Shinto) continue to spread their gospel. 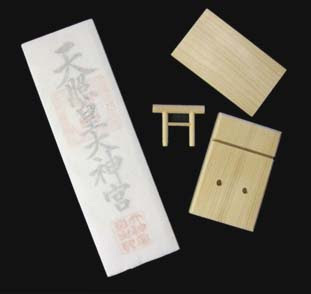 Grand Shrine at Ise, prepare special chopsticks from the divine trees for rituals or sell them as amulets to people. January 1st Saitan-sai The ceremony to celebrate the start of the New Year. January 3rd Genshi-sai The ceremony to celebrate the foundation of Japan by Ninigi-no-mikoto, grandson of Amaterasu Omikami. January 7th Showa-Tenno-sai-yohai On the day when the late Showa Emperor passed away, a ceremony in memory of the Emperor is conducted in Jingu, parallel to the ceremony performed in the Kyuchukoreiden of the Imperial Palace. The ceremony to offer sacred food to Amaterasu Omikami and all other deities in Jingu at the Yojoden of the Naiku, followed by a performance of ceremonial music and dances at the Gojoden of Naiku. January 11th Kenkokukinen-sai The ceremony to celebrate the foundation of the nation and to pray for its further development. February 23rd Kinen-sai The ceremony to offer prayers for a plentiful harvest. It is composed of two ceremonies: the one is held to make prayers when the sacred food is served, the other when the Imperial envoy offers the sacred silk and other materials to the kami in the name of the Emperor. Equinox Misono-sai The ceremony is held at the Misono fields in Jingu to pray for a plentiful harvest of vegetables and fruits. Equinox Shunki-koreisai-yohai Paralleling the ceremony to pray for the Imperial ancestors in the Imperial Palace, this ceremony is held in Jingu in memory of the Imperial ancestors. Early in April Shinden-geshu-sai The ceremony related to the Kanname-sai, where the rice that later would serve at the Kanname-sai and other ceremonies is sowed in the sacred paddies. April 3rd Jinmu Tenno-sai-yohai On the day when the 1st Emperor Jinmu passed away, paralleling with the ceremony held at the Imperial Palace, a ceremony called yohaishiki is conducted here in Jingu. May 1st Kanmiso-hoshoku-hajime-sai The ceremony related to the Kanmiso-sai, for weaving both the sacred silk and the sacred hemp at Naiku and the sanctuary Aramatsuri-no-miya is held. May 13th Kanmiso-hoshoku-chinsha-sai The ceremony to give thanks for the completion of weaving both the sacred silk and sacred hemp beautifully is held. 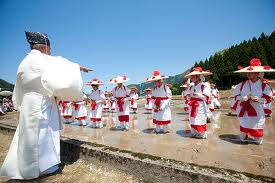 May 14th Kazahinomi-sai This ceremony where prayers are offered for fair weather and adequate rain for a rich rice harvest by offering sacred materials such as twigs with silk, traditional raincoats and hats made of straw and formerly used in agriculture, is conducted in May and August. May 14th Kanmiso-sai Twice a year, in May and October, the sacred silk, and the sacred hemp are offered at Naiku and Aramatsuri-no-miya to become the clothing for Amaterasu Omikami. According to Japanese mythology, Amaterasu Omikami had used a handloom in Heaven. Early in May Shinden-otaue-hajime-shiki The ceremony of transplanting the rice at the sacre paddies that is to be served at the Kanname-sai. June 1st Misakadono-sai The ceremony to address prayers to the kami of sake to pray for good fermentation of the sake served in the three great ceremonies of Tsukinami-sai in June and in December, and Kanname-sai in October. The ceremony to worship Okitamanokami who is the kami protecting the land of the main sanctuary. 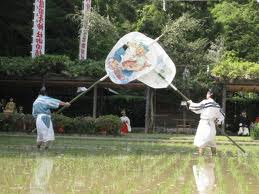 It is performed at the Naiku prior to the Tsukinami-sai in June and in December, and Kanname-sai in October. June 15th Miura The ritual is held at the Naiku to establish by divine divination the suitability of the priests to officiate at the ceremonies of Tsukinami-sai in June and December, and Kanname-sai in October. June 25th Tsukinami-sai This is one of the most important ceremonies at Jingu. It is composed of two parts: Yukino-omike Ceremony, the offering of sacred food twice a night, 10:00 P.M. and 2:00 A. M., and the Hoheisai ceremony, where sacred silk and other materials are offered at noon. 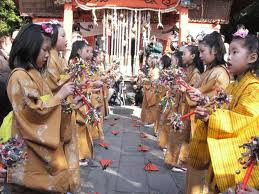 They are followed by similar ceremonies at Betsugu and other small sanctuaries. June 30th Oharai On the last day of a month preceding a month of important ceremonies, a ceremony to purify the priests of Jingu and the court musicians is held. Especially in June and December, a Purification Ceremony for all the staff is conducted. August 4th Kazahinomi-sai The ceremony to offer prayers and twigs with silk for fair weather and a bountiful harvest. Early in September Nuibo-sai The ceremony to harvest the beautifully grown shieves of rice at the sacred paddies. The shieves are later offered at the kanname-sai. 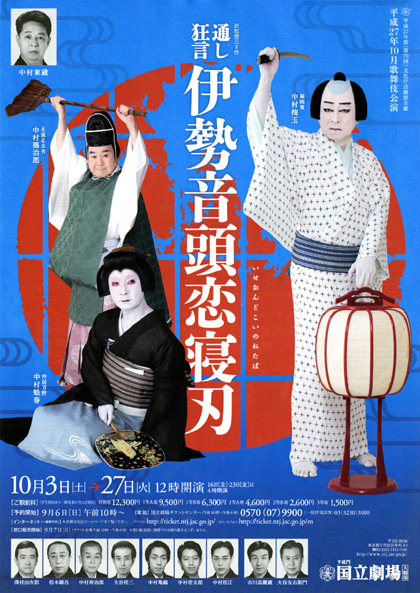 Equinox Shuki-koreisai-yohai Similar to the Shunki-koreisai-yohai ceremony in March. October 1st Misakadono-sai The same as in June 1st. October 1st Kanmiso-hoshoku-hajime-sai The same as on May 1st. October 5th Mishiodono-sai To offer prayers that excellent salt for use in various ceremonies can be made, and that the people engaged in producing the salt are protected. October 13th Kanmiso-hoshoku-chinsha-sai The same as on May 13th. October 14th Kanmiso-sai The same as on May 14th. October 15th Okitamanokami-sai The same as on June 15th. October 15th Miura The same as on June 15th. October 25th Kanname-sai The annual cycle of ceremonies culminates in the Kanname-sai, the most important ceremony in Jingu. It consists of three parts. At first, nocturnal offerings of sacred food are presented in the Yukino-omike ceremony. Then, the Imperial envoy presents sacred offerings of silk and other materials in the Hoheisai ceremony. 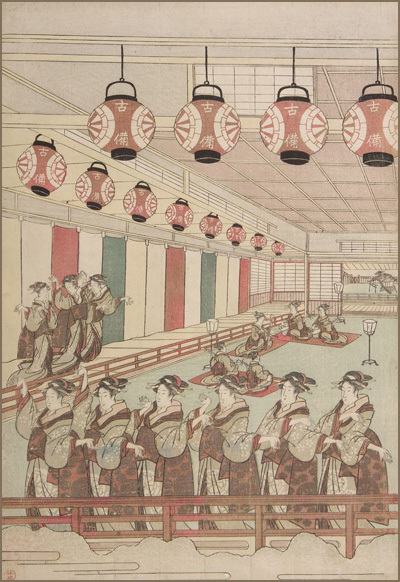 Finally, ceremonial court music and dance are dedicated to the kami in the Yojoden at night after the Hoheisai ceremony. November 29th Niiname-sai The Niiname-sai ceremony in Jingu is composed of both Omikesai and Hoheisai. These ceremonies are conducted in the name of the Emperor. The Niiname-sai is held parallel to the ceremony at which the Emperor officiates and offers the newly harvested rice to Amaterasu Omikami in the Imperial Palace. By partaking of the food offered he ritually receives the deity's blessings. December 1st Misakadono-sai The same as on June 1st. 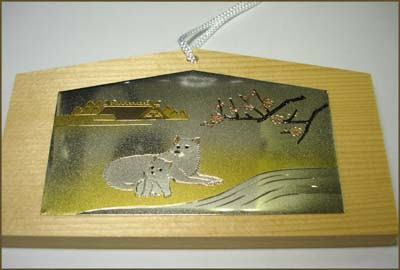 December 15th Okitamanokami-sai The same as on June 15th. Miura The same as on June 15th. December 25th Tsukinami-sai The same as in June. January 8th Taima-reki-hosei-hajime-sai The ceremony is held to announce to the kami the start of producing the Jingu Taima (talisman) and the Jingu traditional calendar. March 1st Taima-reki-hampu-shuryo-sai The ceremony is held in Kaguraden at Naiku to report to the kami that the distribution of Jingu Taima and the calendar has been completed. Middle in April Taima-yozai-kirihajime-sai Before starting to cut the wood to be made into Jingu Taima, the ceremony to offer the sacred food is conducted at the site of Maruyamasaijo on the top the mountain beyond Uji Bridge. September 17th Taima-reki-hanpu-hajime-sai The ceremony is held at Kaguraden, Naiku to report to the kami the beginning of the distribution of Jingu Taima and the calendar to worshipers. December 20th Taima-reki-hosei-shuryo-sai The ceremony is held to report the completion of making Jingu Taima and the calendar at the end of the year. Read the comment by Chris !
. Ise Jingu 伊勢神宮 Ise Grand Shrine . Amaterasu Omikami is a deity in charge of all things that humans can see.
. Izumo taisha 出雲大社 Grand Shrine at Izumo . and Hinomisaki Shrine 日御碕神社 close by at the beach. Okuninushi (Daikoku) is a deity in charge of all things that humans can not see, especially relationships and feelings. "The Inner Shrine had already been moved, but I worshipped at the Outer Shrine during its Ritual of Renewal." "Autumn: Ritual of Renewal, 1689 (mid-Ninth Month; late October). Both the Inner and the Outer Shrines at the Grand Shrine of Ise are rebuilt every twenty years. In 1689, after the journey chronicled in 'Narrow Road to the Deep North', Basho went to witness the ritual of changing from the old to the new shrines. He arrived on the 11th of Ninth Month, one day after the renewal ritual for the Inner Shrine. The ritual for the Outer Shrine was on the 13th." Along the river Nihonbashigawa 日本橋川, between the bridges 道場橋 Dojobashi and 雲母橋 Kirarabashi (Kirara-bashi). This part was called Isechokashi 伊勢町河岸 Ise river bank.